Market trends from January extended into early February as investor confidence increased, risk assets rose and government bonds sold off. There was, however, a sharp reversal mid-month driven by uncertainty around the Italian elections (and their implication on future fiscal policy both in Italy and abroad) and growing concerns surrounding the US sequester deadline. Equity markets showed this picture well, with the S&P 500 index up around 2% up to 19 February, before falling sharply; the index pared back a portion of the losses with a modest month-end rally to end the month up 1.1%. The character of the mid-month equity market sell-off was more interesting than the sell-off itself. For much of 2012, investors (particularly retail investors) had been pulling money from equity markets, contributing to low volumes and higher inter-stock correlations. Market behaviour in January started to suggest that these characteristics were changing, with a strong equity market rally coincident with higher dispersion levels, positive asset flows and higher volumes. During the risk-off move in February, inter-stock dispersion remained high, supporting the view that stock behaviour is becoming increasingly driven by company-specific risk. Notwithstanding the inflows (and generally positive performance) in equities, we have seen littleevidence to support the claim of a “Great Rotation” from bonds into equities. So far this year, mutual fund flow data has shown few signs that the flows into fixed income are abating; for the most part, equities purchases have been funded using cash. It remains unlikely that large outflows from government bond funds will take place until there is some persistent improvement in global growth. Indeed, the JPM Global Government Bond Index finished February up 0.6%. Another proxy for global growth which showed signs of weakness through the month is commodity markets. There was a broad-based sell-off in commodity markets (the GS Commodity Index fell 4.0%) which has been partly attributed to weakening demand from emerging countries such as China. The market gyrations on the back of the Italian election contributed to the first meaningful increase in implied volatility on 2013. In a breakout from the recent environment of very low implied volatility, the Vix index increased from 12% to 19% over the course of a few days. Coming into February, many commentators had been surprised by both the steepness of the Vix forward curve (i.e. 1-month volatility was 12%, but 12-month volatility was nearer 20%), and the extreme of normalised skew in volatility (i.e. the price of a put versus the price of a call was at record highs). The explanation for both of these characteristics was largely pinned on the upcoming sources of market uncertainty, most pressing of all being the Italian election. It seems that the market was right. Looking forward, it will be interesting to see how the volatility market normalises again (in the absence of any other short-term shocks) – if the forward curve quickly reverts to a similar level of steepness, it may be indicative of continued investor concerns in the medium term, regardless of short-term quietude. While equity markets may be showing signs of entering a more fundamental pricing regime, investor flows into credit markets remain largely indiscriminate. High yield spreads continue to compress as investors search for yields, with stronger performance from lower-rated bonds being consistent with a yield-seeking rally. The ML HY Master II Index returned 0.4% for the month. More worryingly, there have been substantially increased flows into the US loans market. The five highest weekly flows in history have all occurred since the beginning of 2013 (as shown in Fig.1). Based on some metrics, over half of the loan market is now trading above par – a dangerous situation considering how easy it is for companies to call loans and reissue (similar, but less startling, conclusions can be drawn on corporate bonds with embedded calls trading above par). In currency markets, the sell-off in the Japanese yen versus the US dollar took a breather in February, with exchange rates hovering around 93 yen per dollar. It is not yet clear how much of the recent move is due to profit-taking; many market commentators expect the sell-off to continue in some form through 2013. The largest currency moves during February were in the euro (down 3.7% versus the US dollar), giving back some of the gains from January, and sterling collapsing further on the Moody’s downgrade of UK sovereign debt from AAA to AA+ (sterling fell 4.3% versus the US dollar). Looking ahead, further political manoeuvrings in Italy, and German elections in the second half of this year may add to further market uncertainty. Fundamental economic data released so far this year have been very mixed. For example, of the manufacturing purchasing manager indices (PMIs) released on 1 March 2013, Germany exceeded expectations, Italy missed, and France’s figure of 43.1 remains abjectly low. One positive for equity markets going forward is the level of cash held on corporate balance sheets and in private equity funds. Whilethis has not been deployed due to systemic risk aversion in the corporate sector for a number of years, we have seen a palpable increase in confidence in 2013, with the announcement of several large M&A deals. Furthermore, leveraged buyout (LBO) activity has increased with Dell’s deal leading the way. With investors becoming increasingly intolerant of companies sitting on large cash reserves (cf. the recent ‘near revolt’ of shareholders in Apple at the $137 billion cash pile), it is not hard to see these developments continuing. The hedge fund industry had a positive month in February, with the HFRX Global Hedge Fund Index finishing the month up 0.4%. As we have alluded to in previous commentaries, increased regional and country dispersion is likely to be a positive for global macro traders, particularly if policy intervention becomes less of a market factor in 2013. We see no reason to change this view going forward. Levels of correlation amongst asset classes and regions continue to fall, and the quality of returns from global macro managers have been increasing commensurately. Managed futures managers started February with their largest exposures in equities (largely longs) and currencies (e.g. short Japanese yen). As one might expect, the sharp mid-month reversal in both of these asset classes hurt performance. Most managers gave back the majority of their gains from the first six weeks of the year during the last two weeks of February. By the end of the month, managed futures exposure in equity markets and in currencies had reduced, but managers still have a broadly ‘risk-on’ position. Though there was a large range of performance, equity long-short returns were positive in February. Returns were not entirely beta-dependant, as a number of managers were able to make money even during the days which saw markets fall. Managers have cited higher dispersion, which was prevalent during the risk-on period in January as a continued positive factor during February. This type of environment should allow stock pickers to generate returns independent of market direction. Though managers remain broadly constructive on the case for holding equities (i.e. valuations are attractive relative to other asset classes), risk levels were slightly reduced during the month, partly owing to profit-taking following a strong January. Relative value managers experienced a mixed February. The best performers appear to have been in the event arbitrage space, where managers benefited from increased deal activity, and convertible arbitrage, where rising equity markets and higher volatility were helpful for generating return. Statistical arbitrage generally made money, though some managers gave back their mid-month profits on the volatility spike towards month-end. (As a reminder, most arbitrage strategies tend to like the opportunities arising from higher volatility; sharp increases, however, tend to confer a more difficult environment in which to make money). We believe that the outlook for relative value managers is positive, particularly in the event arbitrage space. Over 2012, the main factor preventing corporations from engaging in activity was a lack of confidence. Several large deals have been announced in early 2013, and confidence appears to growing. As such, there is now a stronger expectation that the level of corporate activity will be higher this year. While the opportunities to profit from traditional merger arbitrage may be limited by tight merger spreads, it follows that event driven managers generally have greater opportunities in times of high corporateactivity. The biggest story for commodity managers over the month was the negative price action in both precious and base metals. The move in base metals was caused by a change in the supply and demand dynamic. There are fears that the high demand for commodities from a growing Chinese economy may be slowing, while in certain base metals there is evidence that the supply may be growing. It is possible that excess supply may be common to other commodities but nevertheless, we continue to think that managers can still profit by trading around the idiosyncratic drivers that have tended to dominate in the commodity market. Credit managers produced flat returns in February, as markets continued to rise with little in the way of inter-market dispersion. We note that while dispersion levels in corporate bonds have been increasing (particularly on the back of LBOs and company specific news), it remains stubbornly high, restricting the return-generating environment for credit hedge funds. Managers are becoming increasingly aware of the systemic risks arising from indiscriminate inflows into the credit market. Whilst credit pricing should not be unduly technical, short-term risks are material. Investments in callable securities currently trading above par and the potential liquidity mismatches of retail products (that operate on daily liquidity) trading high yield and other less liquid securities are two potential sources of short-term market dislocation. Many hedge fund managers are keeping sufficient dry powder to capitalise if shocks do occur; but the nature of credit markets and current investor appetite means they could be waiting a long time. A fuller analysis of February performance by strategy will be available in FRM’s Viewpoint in mid-March. 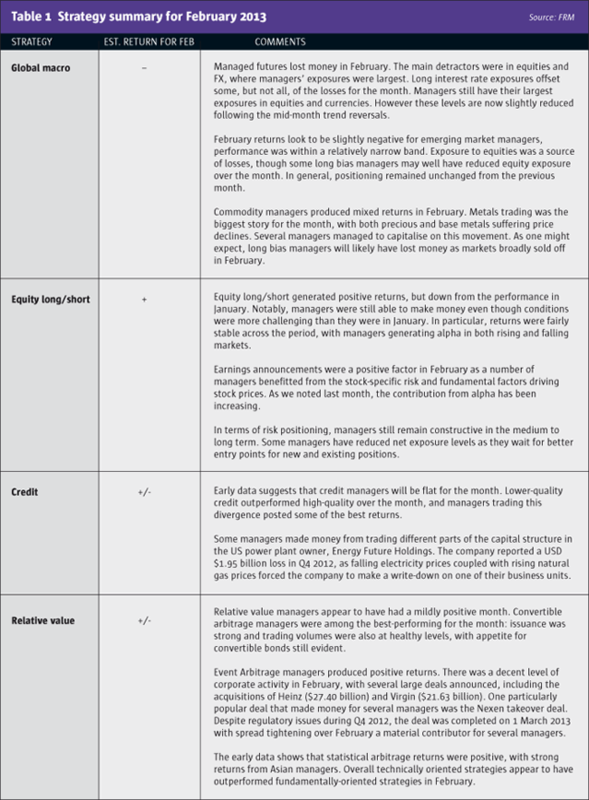 In addition, our views on strategy allocation will be available later this month in FRM’s Investment Strategy update.